I made two little changes: I stitched the french knots in the same colors as the flowers (accidentally) and stitched the stems in straight stitch instead of stem stitch (on purpose.) I used the recommended DMC colors. Remember seeing these socks before? (here and here) They knit up really fast using some unknown thrifted yarn, sportweight I believe. I really lucked out that there wasn't ugly pooling since they were both variegated yarns...and they are oh-so cuddly soft! I can cross 3 projects off my rather long list of things-in-progress! Thanks for stopping by my neck of the woods and for all your heart-warming comments. I'm behind in my blog commenting, even though I've been reading them...just when I seem to get caught up, I get behind again, LOL ;) Hope you're all having a good week, toodles! Love, love, love those pillowcases Staci. The pillow cases look so nice!! Congratulations on your beautiful finishes. Lovely finishes!! You need to show a picture of the pillows adorning the bed! Love these pillowcases - where did you ever find them?? Your pillowcases are a real dream :>) The colours are wonderful and the design really is really eyecatching. The socks are really pretty too and don't they match the pillowcases...haha! 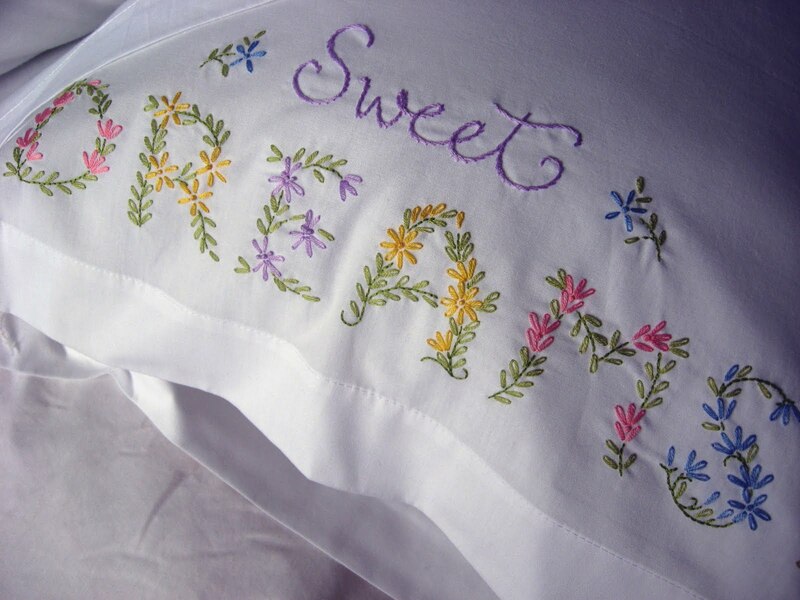 How could you not have sweet dreams on your beautiful pillowcases? This pair is one of the prettiest I've seen! Beautiful job Staci. I love your socks too, and they do look very soft and cuddly. Hope you're having a good week too! Oh the pillowcases are just so lovely, so springy looking and the socks wow they are pretty. Your blog is always so inspiring, Love it! Such beautiful pillow cases. Makes me want to take a nice afternoon nap on a lazy spring day. Very nice socks as always. What wonderful pillowcases! And the socks...well they look really soft and fun to wear! Congrats on your finishes. Love the color of the socks and the pillow cases are so pretty! Oh those pillow cases are just too beautiful to sleep on Staci and those socks do look comfy! I just love, love, love the pillowcases - are they a kit? Can you share where you found them? And your socks are so pretty and spring looking. I've seen these on Sew and So and often thought i'd like to have a go at embroidery, can i ask are there instructions on the stitches used? I just opened a google acct., so now after months of reading your blog, I can finally comment! Love your blog and enjoy reading it. Love all the socks that you make...maybe someday I'll try a pair. I liked your idea of making a rainbow set of dishcloths and recently made two sets to bring as hostess gifts when visiting my son in OK. Made 5 more sets of 3 (2 solid colors that coordinated with a multi color) that I also brought along. Thanks for the inspiration! So many beautiful things in one post--you make me want to embroider again. Those socks are so pretty too. Love the yellow. Those socks are awesome ....thrifted yarn done just in time for Earth Day. Congrats on the finishs. Love the pillow cases. They are so sweet and pretty. Oh, Staci! I LOVE The pillow cases - they are so pretty - I don't think I could let anyone actually put their head on them! The socks are really pretty, too! I envy your knitting so. Love the socks!! The colors are divine. Awwww, pillowcases and socks. They both look so cozy!! Makes me want to curl up and take a nap! Lovely pillow cases and the socks are so darn cute ! Your pillowcases are gorgeous, love the changes you made. Congrats on finishing these pretty socks! 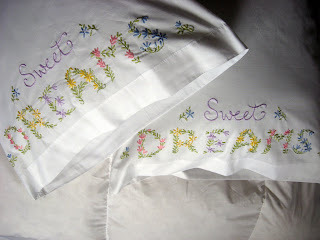 I want to dream on pillowcases like yours Staci - they are gorgeous! Love the pilow cases. The colors are just gorgeous. I'd stay awake at night just admiring them! And those socks are just amazing. Now I have to search thorugh my stash of sport-weights! Love your pillowcases...the colors are so sweet! Great job as always. Beautiful pillowcases. How could you not have great dreams while sleeping on those? ... maybe of more socks to knit. I love the socks too. I was looking on the old posts about the socks. Not to sure about where the pattern comes from. Would you be willing to share a little more info with me about the pattern and how I can go about trying to get my hands on it. I hate buying socks because I seem to go through them in no time, I think they are manufactured to "cheap" these days. Would like to try making a pair for myself. Where I work, the only thing that is unique about are O.R. scrub uniforms are the socks we wear. Your stitches look so even! Love the socks. Lovely finishes Staci! The pillowcases remind me of my childhood as we always had embroidered ones from my mother and grandmother - I had several of those ones with the lady with the crocheted dress. 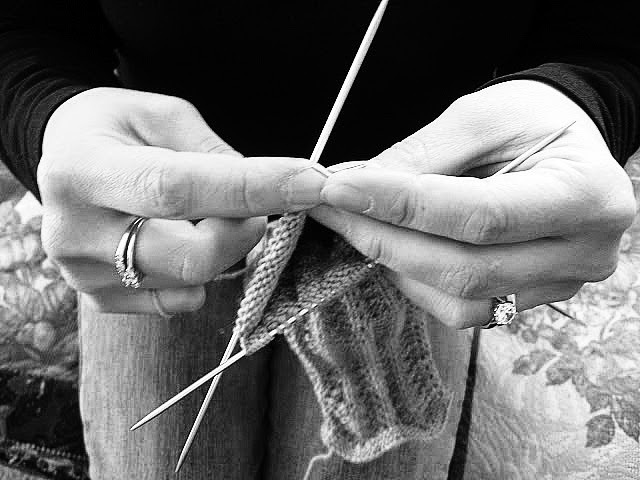 :) Your socks look really cute - I can't knit more than a dishrag LOL. Gorgeous pillow cases and great socks. Wonderful picutres. I love your Sweet Dreams pillowcases....gorgeous!! What a lovely embroidery project. Your pillowcases are so very pretty and I have enjoyed seeing your knitted socks and crochet granny squares also.